But of late the giant German automaker seems to be getting its mojo back, and none too soon. More new models are hitting the streets each year now. For instance, the Tiguan I just tested is all new and among the best in the compact segment. It’s heavier than its competitors, a German automotive trait, but boy does it handle. This is one of the most fun drives I’ve experienced in a while, both for SUVS and crossovers. 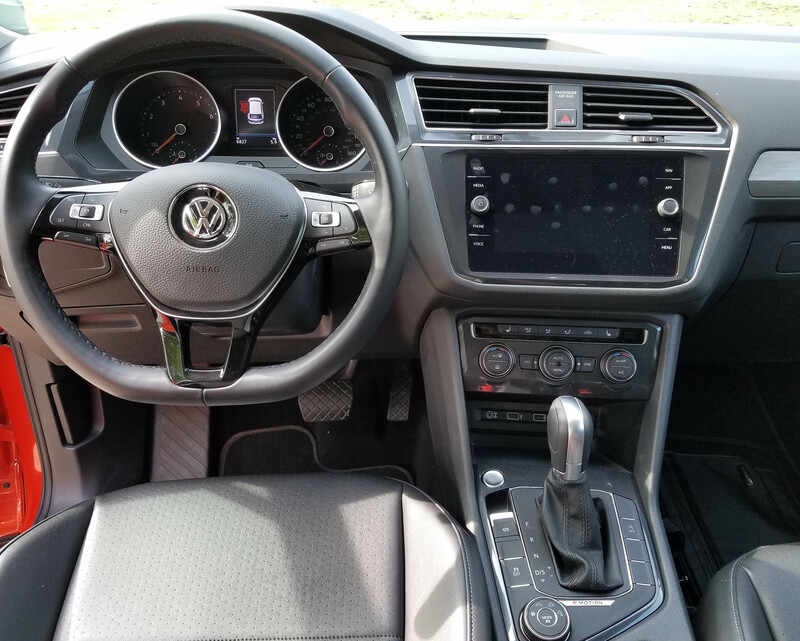 I tested the SEL 4motion model, which is one down from the top Premium trim level and includes VW’s 4WD system that you dial up via a knob on the console. There are four settings, normal, snow, off-road and one you can customize. Turn the knob and away you go, a major plus for snowy Wisconsin in winter. But the handling is what stands out. 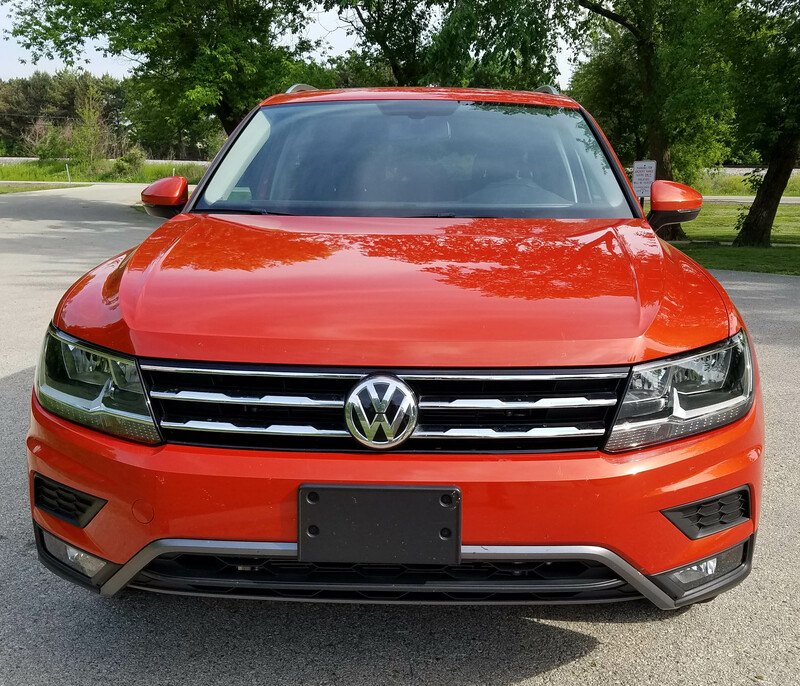 Tiguan’s steering is precise and light, but with great road feel. This feels like sport car, not sport sedan handling. Reaction to steering inputs is instantaneous and the compact ute exhibits no body lean under normal driving conditions, and even some quick, sharp moves. Aiding the grip, along with the AWD when engaged, are 18-inch tires. Plus there’s the usual complement of ABS, stability control and brake pressure distribution with hydraulic assist. Standard safety features also include an Intelligent Crash Response System, forward collision warning and automatic braking with pedestrian recognition, rear cross traffic alert, and blind-spot warning system. There’s no lane departure system, but I didn’t miss it. Ride also is quite good thanks to VW’s suspension tuning and a 109.8-inch wheelbase that spreads the thumps and bumps. But if you’re a VW follower and love how firm and controlled VW usually is, well, you won’t be disappointed. It’s still firm, but so well controlled that there are no severe jolts as you cruise Wisconsin’s crumbling roads. Power is above par here too. The turbocharged 2.0-liter 4-cylinder engine is 184-horses strong and delivers major oomph when pulling away from a stop. That turbo really bumps up the grunt, creating a 221 lb.-ft. torque rating to give it a peppy feel. Except, there remains a lag as in past models, and it feels more like a communication issue between the gas pedal and the engine. This doesn’t feel so much like turbo lag where you have power then the turbo takes a deep breath before delivering the power boost. It’s just a brief pause in the engine engaging once you press the pedal. The transmission is an 8-speed automatic with a sport mode. It shifted smoothly and the sport mode will boost low-end power. 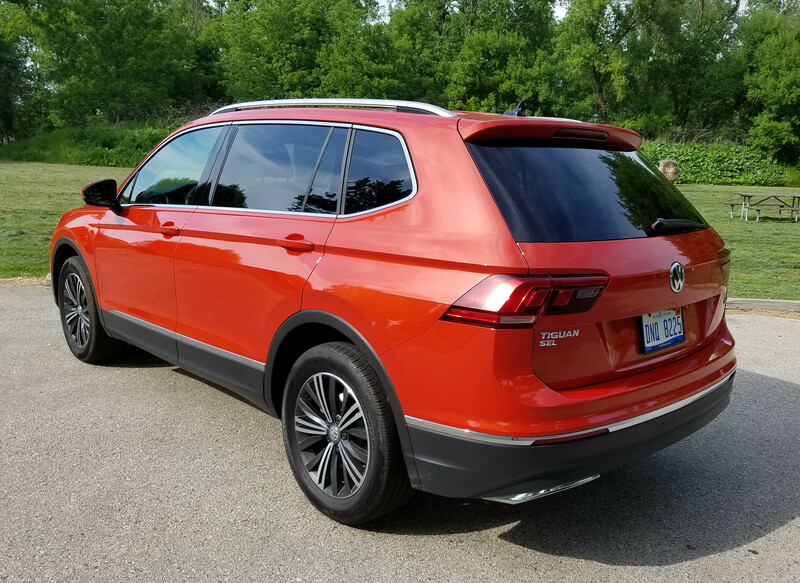 While Tiguan isn’t a ute for hauling the boat or trailer, it is rated to tow up to 1,500 lbs. Inside, the cabin is relatively quiet and comfortable, and definitely roomier than the past model, which had been on the market nine years. Everything now looks new and modern, starting with a large, 8-inch touchscreen display mid-dash. That’s easy to use and understand, plus in improves your view via the rear-view camera that delivers a sharp image. 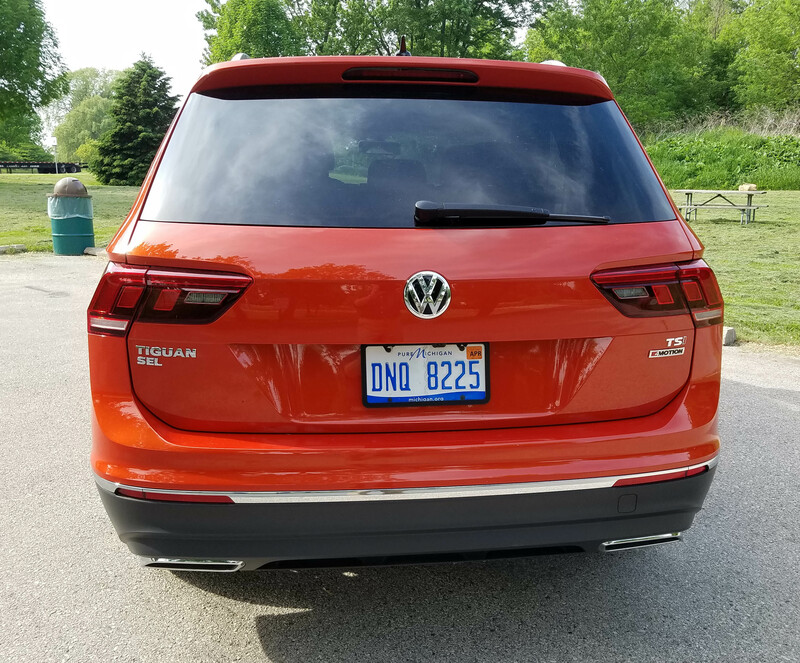 My tester was a snazzy Habanero Orange Metallic outside, a $295 option and worth it, while the inside was a classy looking black with perforated leather seats and a dash with gunmetal gray gloss trim around the radio and on the console. 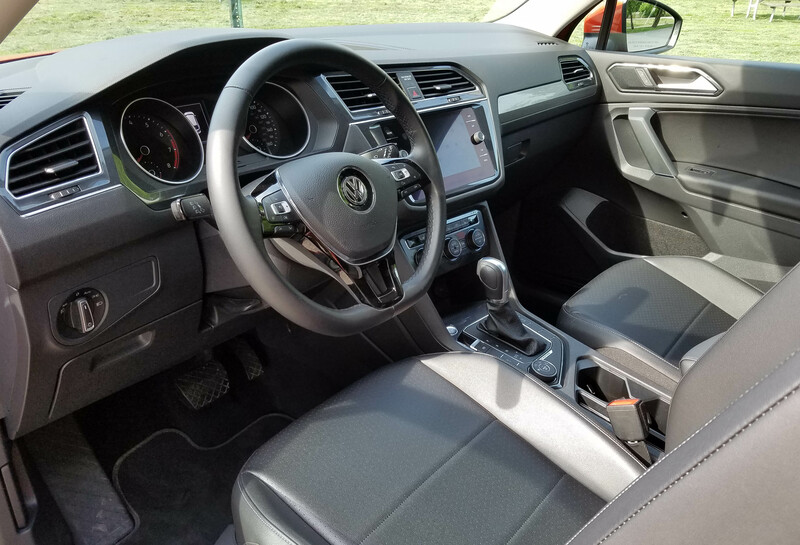 The passenger’s side dash also gets a silver tweed pattern trim to brighten it a bit and the steering wheel has a flat bottom, giving Tiguan a bit of a racy look. I loved the dash layout, simple and easy to see. Plus there’s a manual tilt/telescope steering wheel with the usual assortment of control buttons on the hub. Other features include automatic lights, push-button start, a stop/start energy saving system, inside hatch release to raise the powered hatch, and three big knobs for adjusting the climate control system. Oh, almost forgot to mention there are heated seats here too. The seats themselves are comfy as in well-shaped for good hip and lower back support. The driver’s seat also is powered and has a power lumbar support. But VW’s leather seats are hard, and folks in the back mused that the seats were so flat they felt they’d slide door to door when the ute was cornering, if not for their seatbelts. There is a third row seat though, a rarity for compact SUVs. Last week’s test car, the Mitsubishi Outlander had one and Nissan’s Rogue offers one too. Like those, this one is cramped, but does offer you an option to carry more kids at least. The third row seat costs $500 extra. Cargo space is fine in back and the second row seats, like the third row, will fold down to further boost cargo capacity. 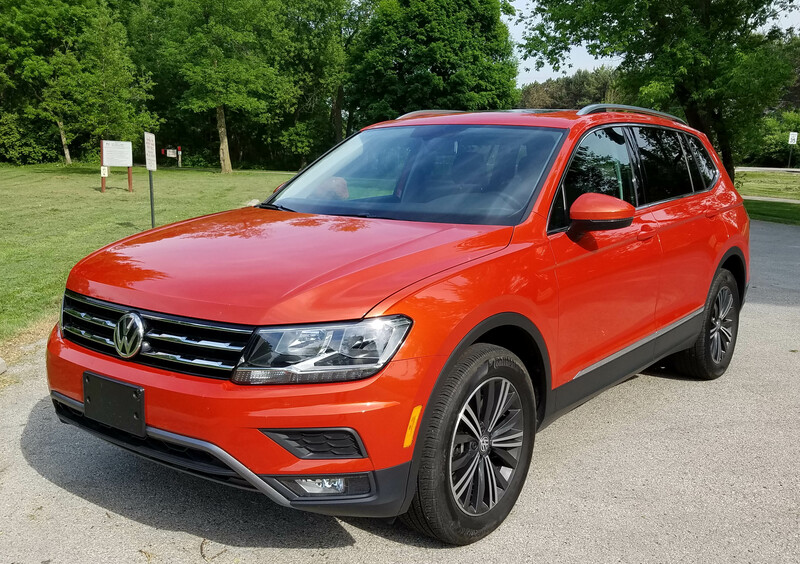 Tiguan also includes a panoramic sunroof and shade and the sun visors slide once flipped to block side sun. Standard too are Apple CarPlay and Android Auto infotainment hookups. Gas mileage is in the ball park with other compact utes at 21 mpg city and 27 mpg highway, according to the EPA. I got 24.1 miles per gallon in mostly city and suburban driving. The teste SEL model starts at $34,750, including delivery, and only nudged up to $35,545 with its two options. That’s just about the average cost of a new car/crossover these days and well below a truck’s cost. You can go with the more economical S model for $24,595, but it does not come with 4WD and some of the other standard features of the SEL. Adding 4WD increases your cost by about $1,300. There’s also and SE model between S and SEL, again in two- or four-wheel-drive. The top level SEL Premium, with 4WD, lists at about $40 grand. VW also steps up to the plate with an improved warranty. This model comes with a 6-year, 72,000-mile limited warranty. 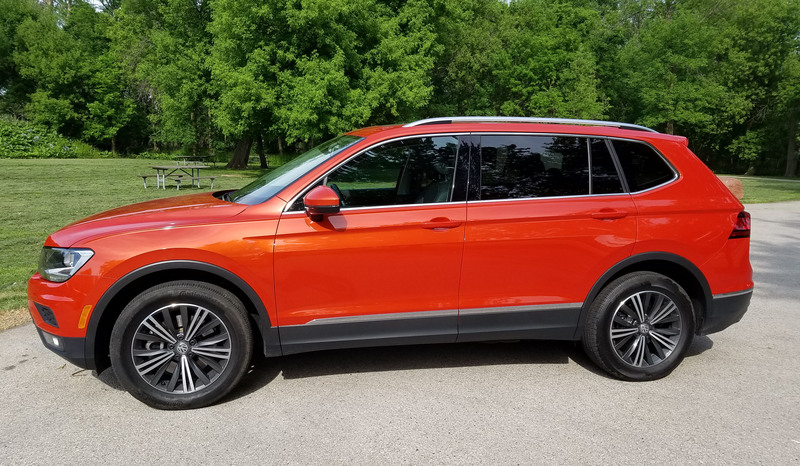 With its improvements and primo driving characteristics it may be time to put VW back on your shopping radar, at least for this, its compact SUV, plus its larger Atlas. And there are some revamped cars (imagine that) set to debut soon too. Stay tuned! Hits: Sportiest handling in the segment, peppy power, firm, but well-controlled ride, 4WD choices, plus panoramic sunroof. Big control scree, visors that slide, power rear hatch, simple dash, third row seat, plus backup camera, blind-spot warning, heated seats. Misses: Seats are pretty hard, third row seat is limited, and acceleration still has a lag, as in the past.